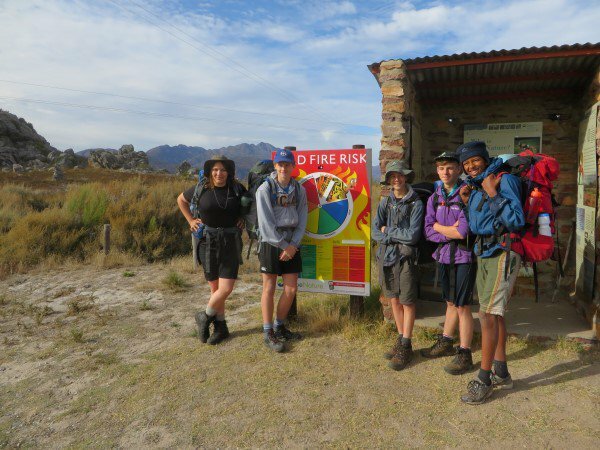 We arrived at Veepos in the Groot Winterhoek for the start of the 2015 senior scout 2 night hike in May. Thus far the winter was dry and we were carrying no tents. Travel time from Cape Town was approximately 2.5 hours due to heavy mist on some roads. The weather was slightly overcast but cool and ideal hiking weather. At 10h00 we were kitted up and we followed the path down to the left, heading towards Groot Kliphuis and our ultimate destination of Perdevlei. 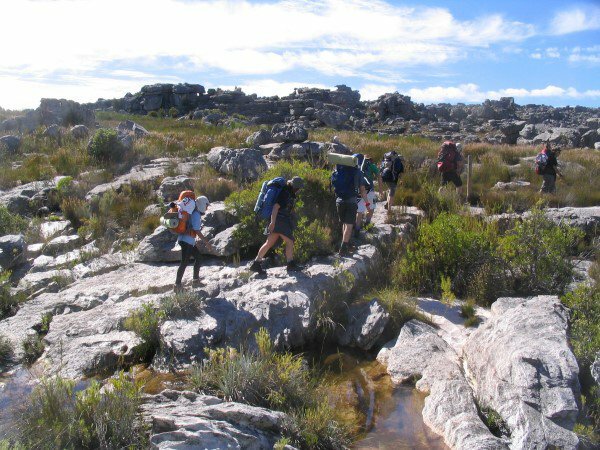 We hiked at a steady pace, stopping every 45 minutes or so for a short break and passing through the fascinating rock formations that make this section of the Groot Winterhoek such an interesting place to be. The route ends up emerging onto the plain from the valley and there are two very indistinct options at this point. One is to turn left onto the plain and pick up a path/ jeep track which heads over the plain towards Groot Kliphuis. The other is to hug the hills on your right and follow the path over rolling hill. Somewhat inadvertently we stayed right and at about 14h30 we crested a hill to find ourselves looking down on Groot Kliphuis on our left with Groot Winterhoek peak itself off to our right and ahead. Clearly we were several hours ahead of ourselves compared to the previous year. We found this route to be considerably more interesting than hiking over the plain. 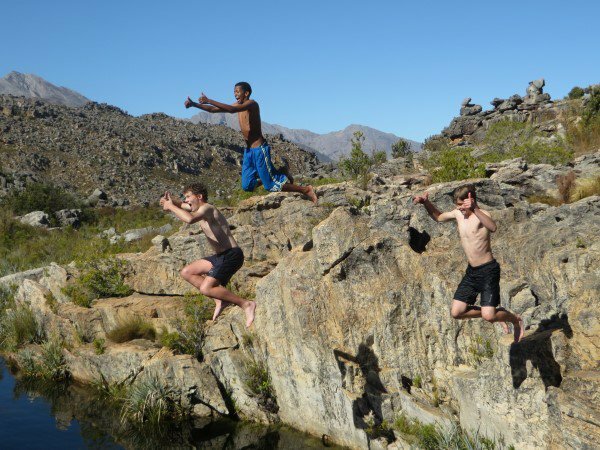 With time to reach Perdevlei we skirted Groot Kliphuis, picked up the jeep track and headed into the unknown with only our trusty 1:50 000 map to guide us. What followed was a sharp uphill with a seemingly never ending series of very sharp ups – a demanding step at the end of the day. 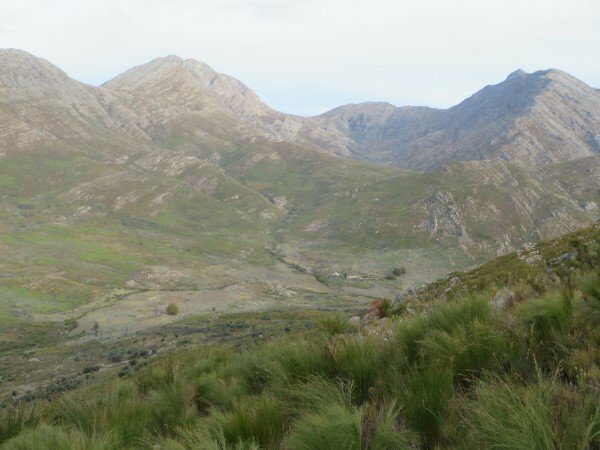 Eventually we reached the top and found ourselves looking down on Perdevlei via a sharp drop, not as bad as Arangieskop but still pretty difficult at the end of 20 kms hiking. It is difficult to believe that any car could travel this road. The path is very overgrown which restios higher than 2m in the middle and some serious ankle turning terrain. After some 45 minutes we eventually reached the lone oak tree at the bottom (the path went straight to the oak tree), it now being 17h00. A quick scout around revealed no water. Twenty minutes of bundu bashing revealed at river some 200 meters from the tree, an emergency shelter and, after some scratching around, the very overgrown remains of the jeep track leading back to the oak tree. Disdaining the emergency shelter, we slept under the oak tree, at least 10 kms from any other person. 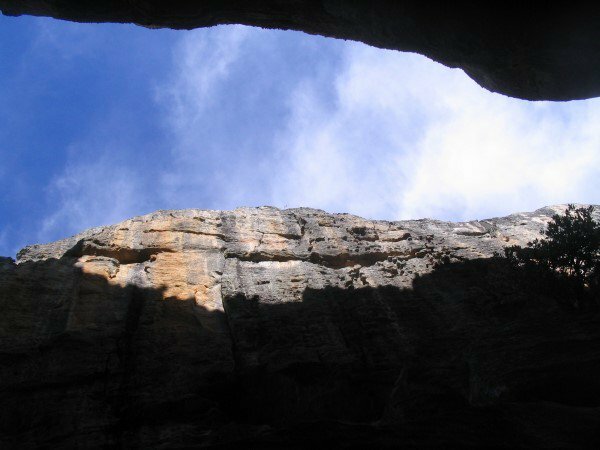 Perdevlei itself is the most fantastic place, located in a bowl of mountains. It is quite clear that these are fold mountains and it is easy to see where the earth cracked when the fold mountains were raised. The remoteness and the clear lack of many visitors makes this a special place. Clearly more people are visiting Perdevlei from the De Tronk side as the path is more clearly defined but they would appear to staying at the emergency shelter as the path from the emergency shelter is very overgrown and in a few years will have completely disappeared. After a pretty cold night breakfast was held at the emergency shelter due to its proximity to water and thereafter we set off down the valley towards De Tronk, passing through largely burnt land. Some regeneration is taking place with green sprouts coming up here and there but largely we hiked through a wasteland. 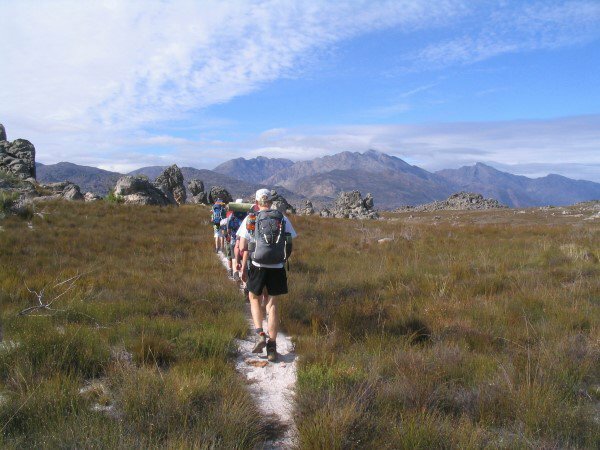 It was only a kilometer or so away from De Tronk that we passed into green and growing fynbos. We reached De Tronk at about 14h30 and after a rest (for some anyway) we walked down to Die Hel where the insane had a swim. Back to De Tronk and the trusty oak tree, supper and an early night. Check out the full album of photos under the 2015 photo gallery.